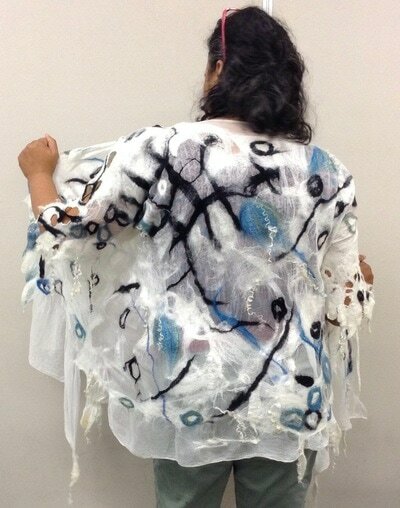 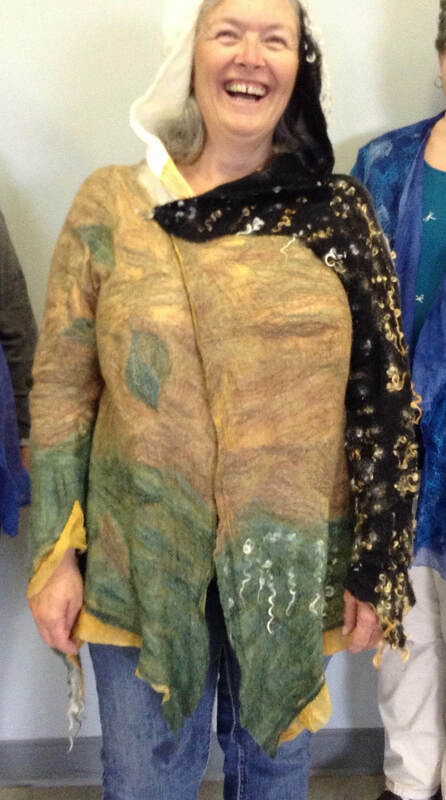 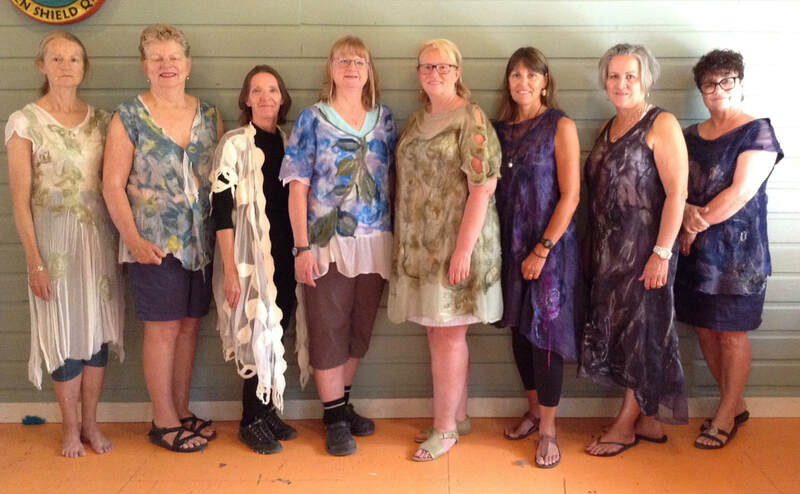 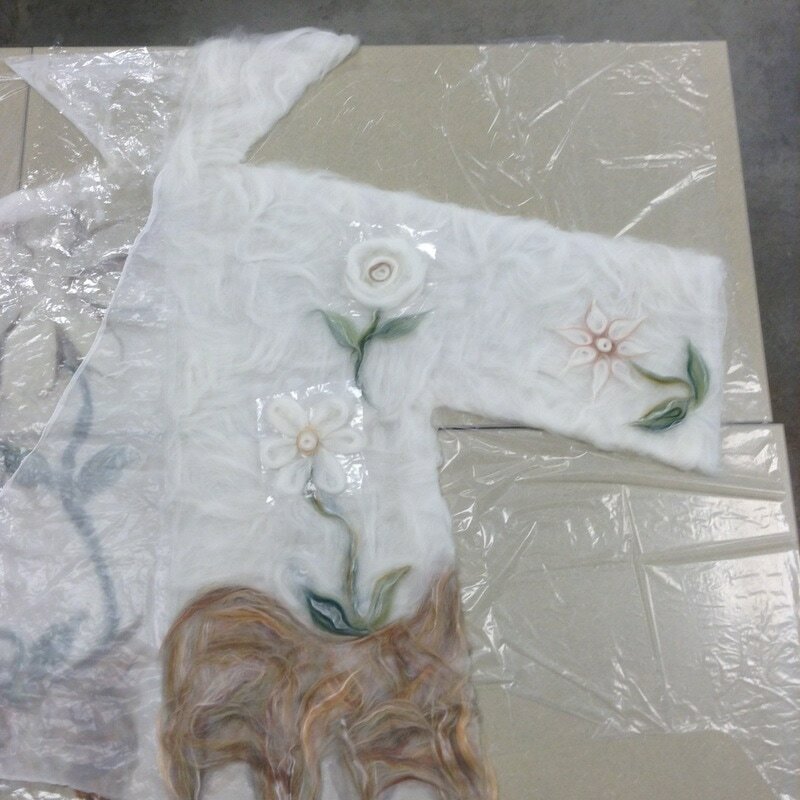 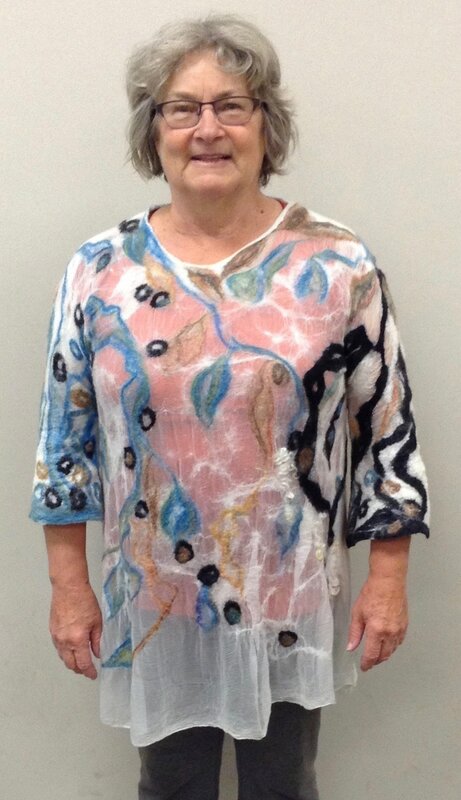 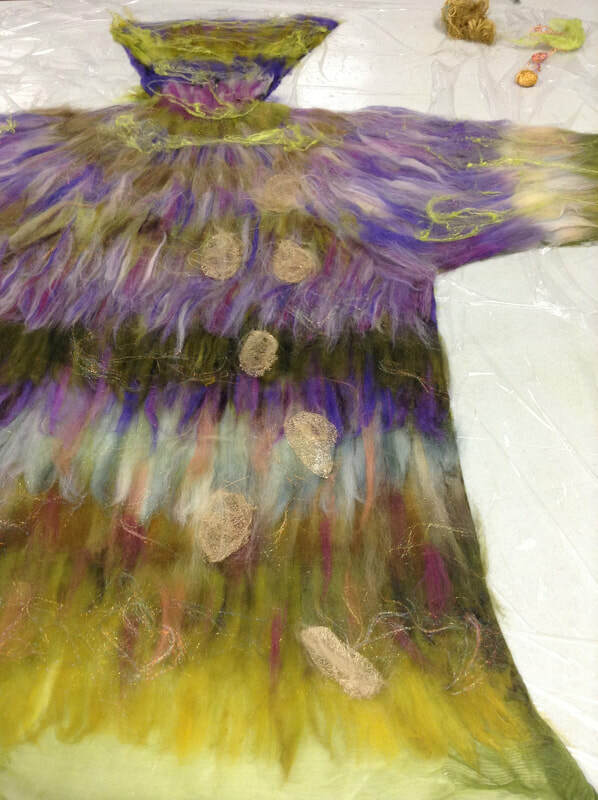 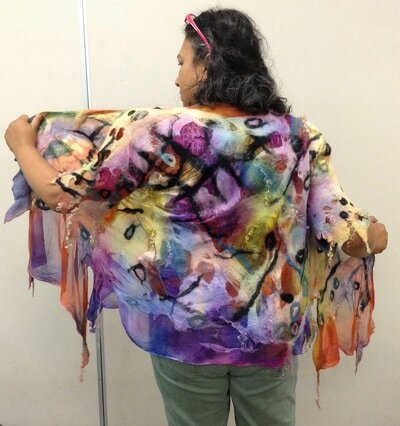 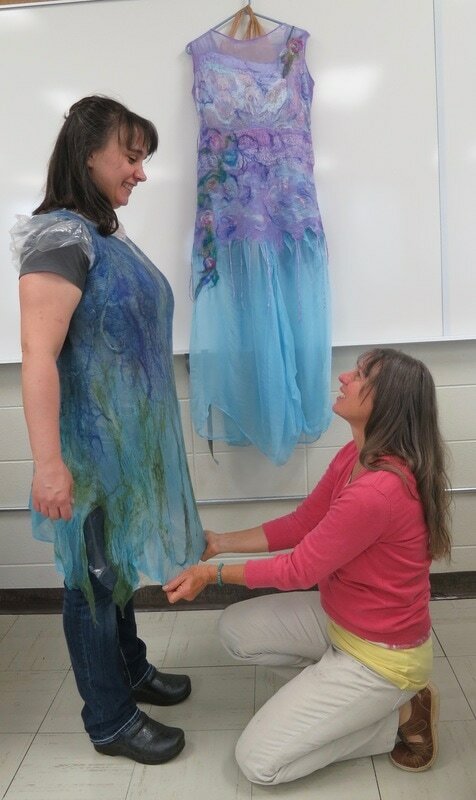 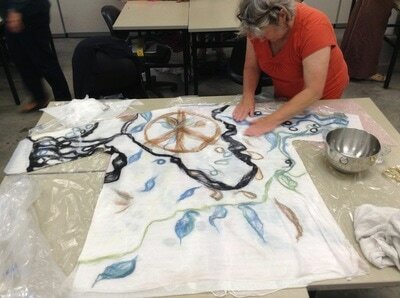 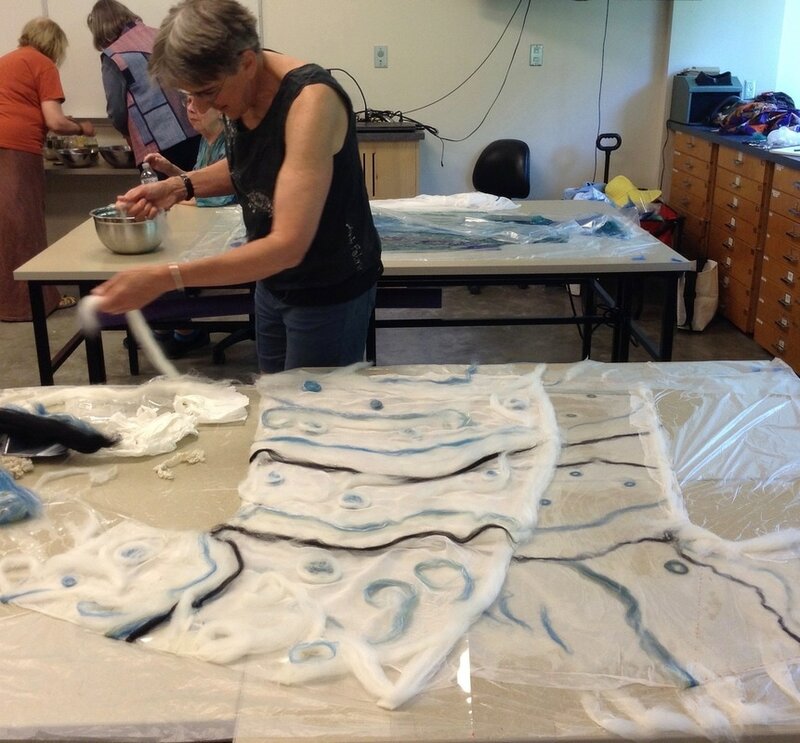 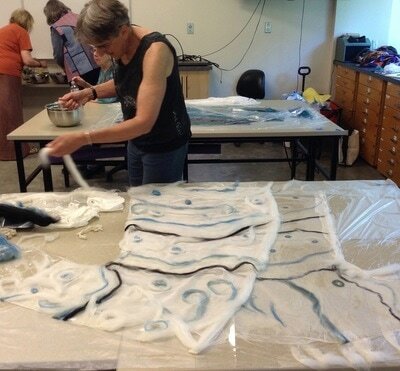 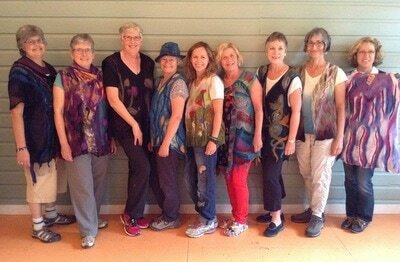 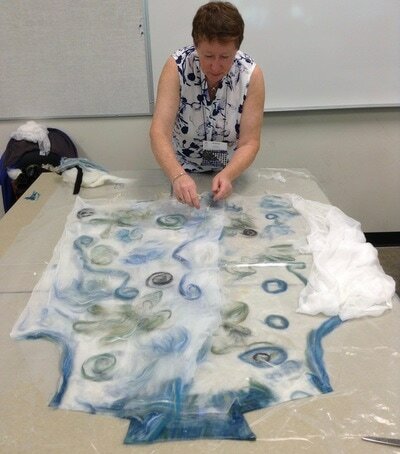 Garment workshops : "designing your own"
Breezy Silk Chiffon garment, working light and layers for nuno felting. 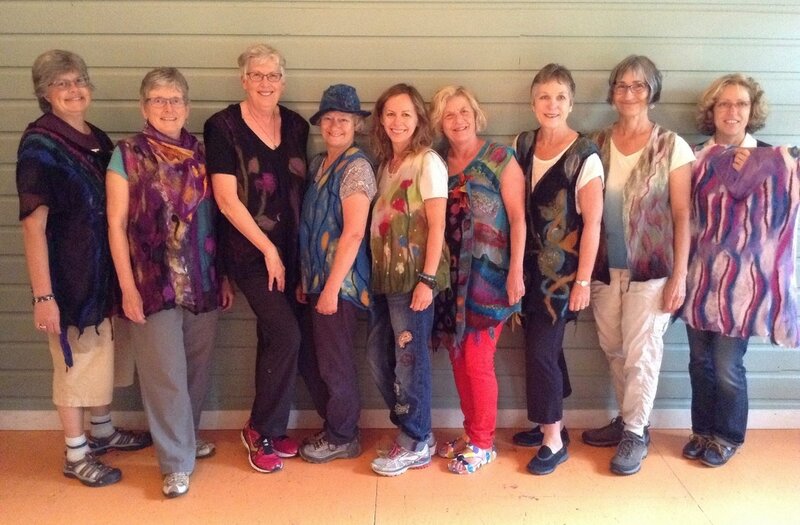 We begin the workshop with learning how to measure and create a seamless garment resist with shrinkage allowance called a "sloper" that allows you to design on it, more than one type of garment style made to fit you perfectly. 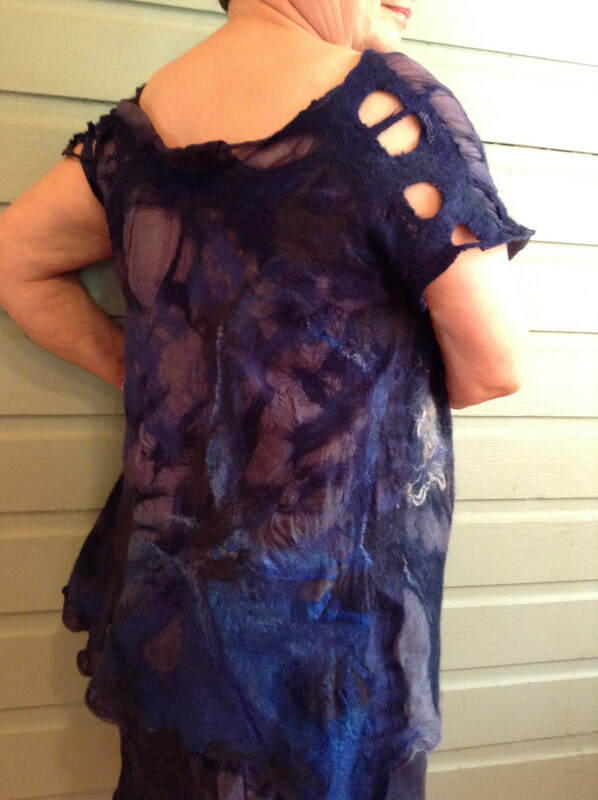 This can be either a vest, dress or tunic and has an option of including sleeves. We then dye and set our silk chiffon fabric base to work on and learn how to use it for our design. 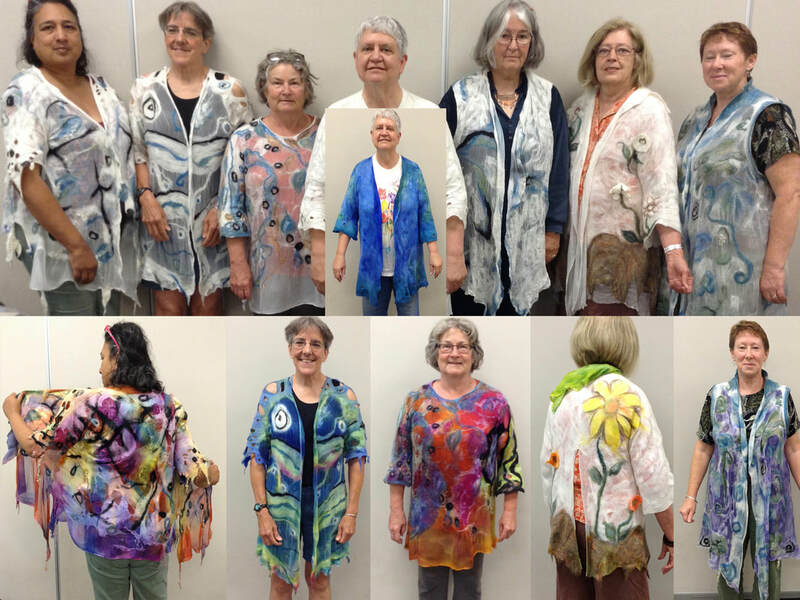 Laurie helps you to execute your design and this also helps everyone in the workshop to learn how to create many styles from each other. 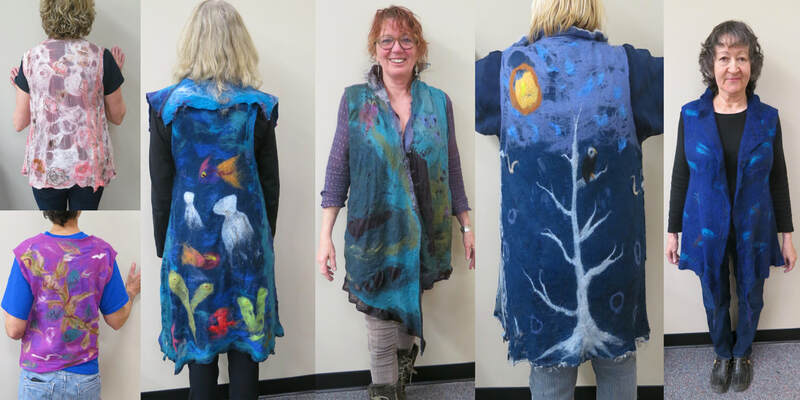 Demonstrations and tips for making the felting process easier are shown as well as colour layering, piecing silk fabrics, shadow layering, multiple resists, pre-felts and fibre embellishments. 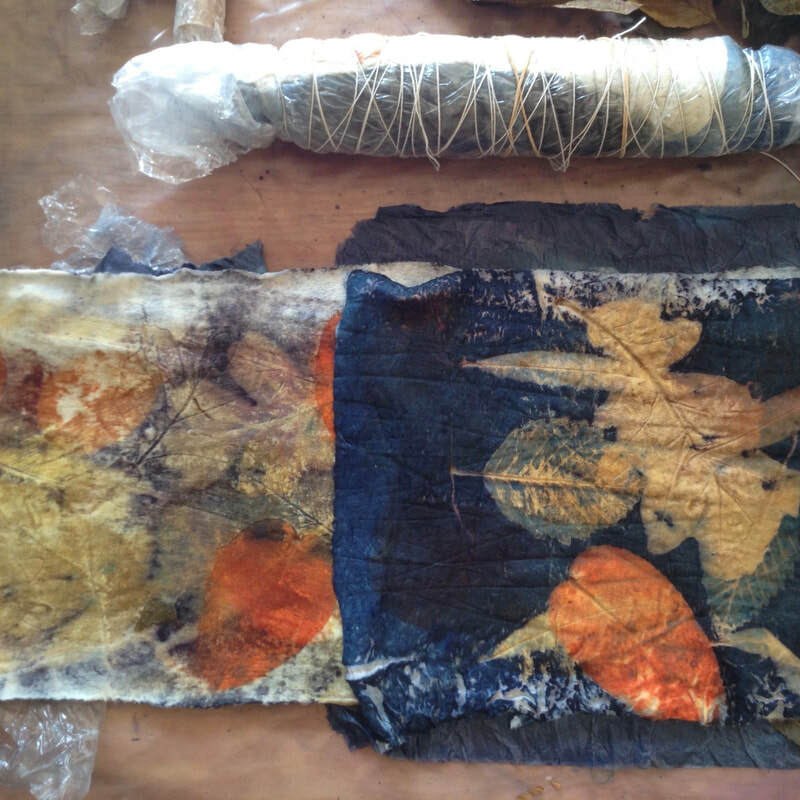 You can bring design ideas and photos of designs that inspire you to help you create your project. 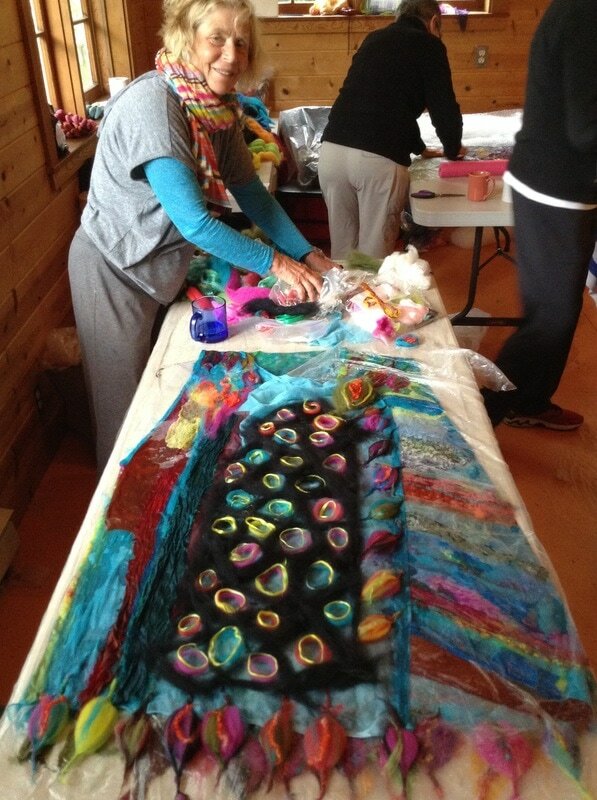 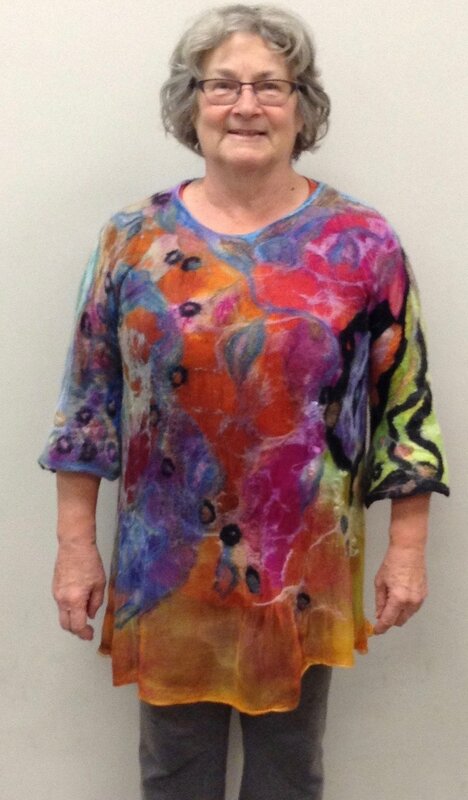 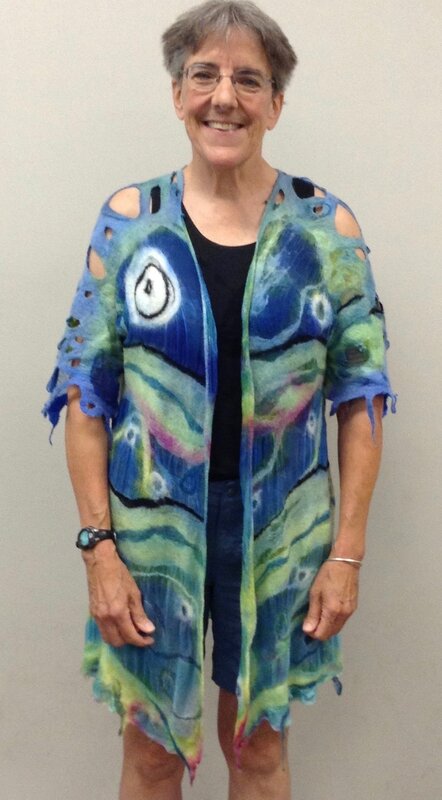 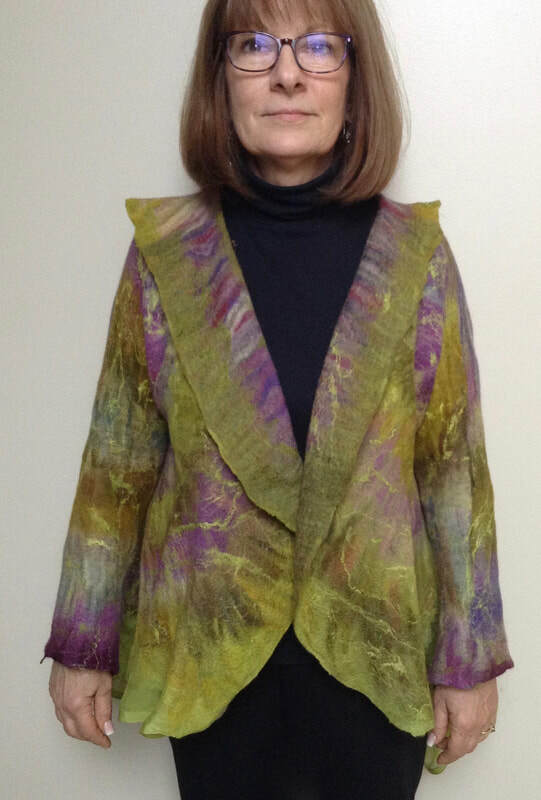 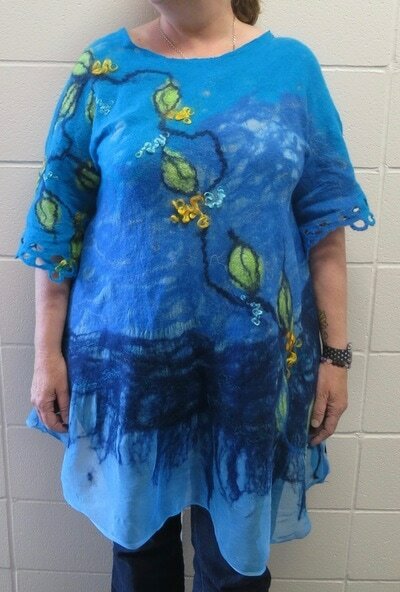 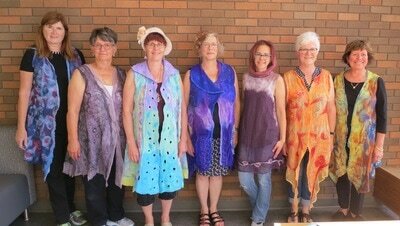 Laurie has 30 years of felting experience and can help you create anything you can conceive. You will learn how to felt by hand with tips and techniques that will make the felting process as easy and fast as possible. 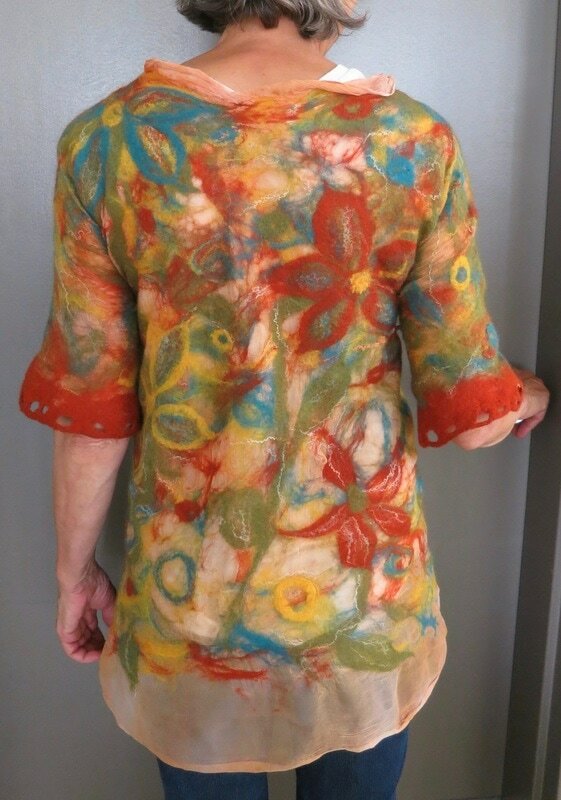 You will learn how to measure and create a garment sloper resist for sleeves with shrinkage allowance. 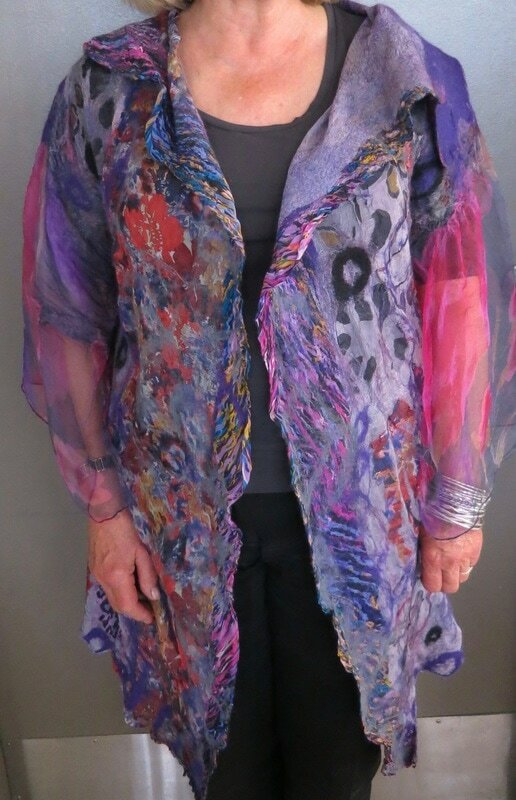 This one resist will allow you to make a felt jacket, pullover, coat, tunic or dress to fit you properly in your own unique style. 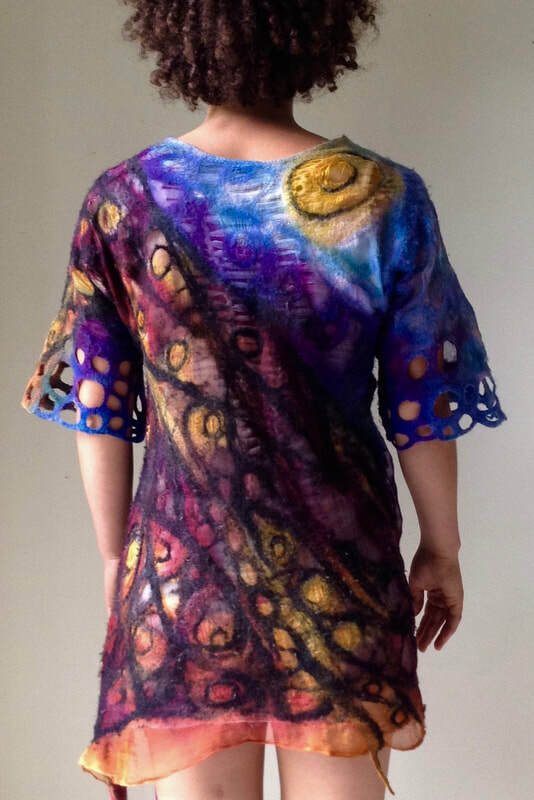 You can choose this project to be double or single sided and as light or warm as you desire. Laurie will demonstrate colour layering, using silk hankies, piecing different silk fabrics, shadow layering, multiple resists, pre-felts and embellishments using merino wool on a silk chiffon base. 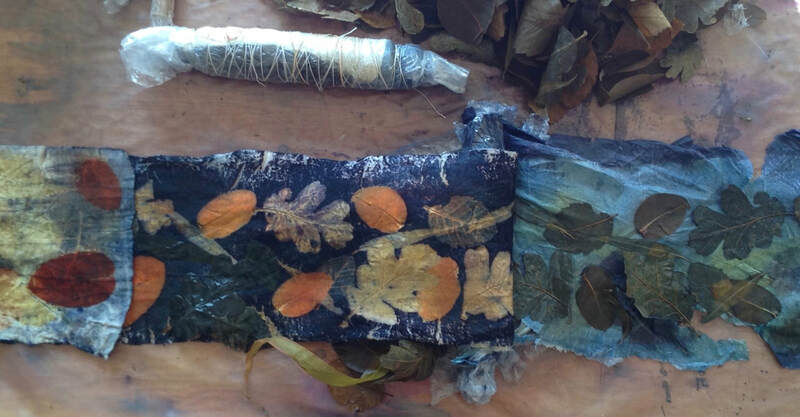 You can bring design ideas and photos of designs that inspire you to help you create your project. 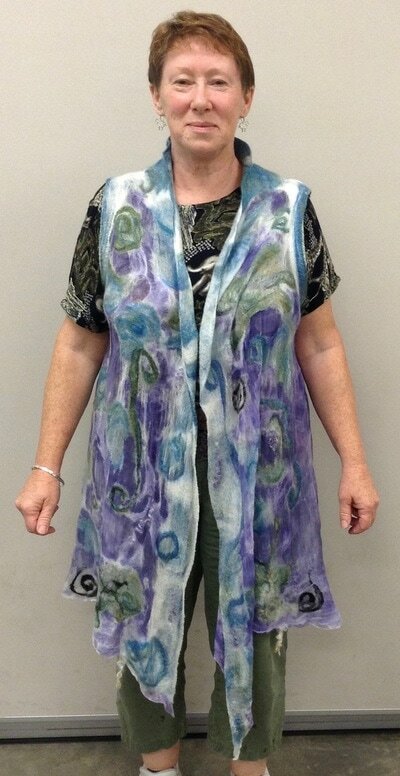 Laurie has 30 years of felting experience and can help you create anything you can conceive. 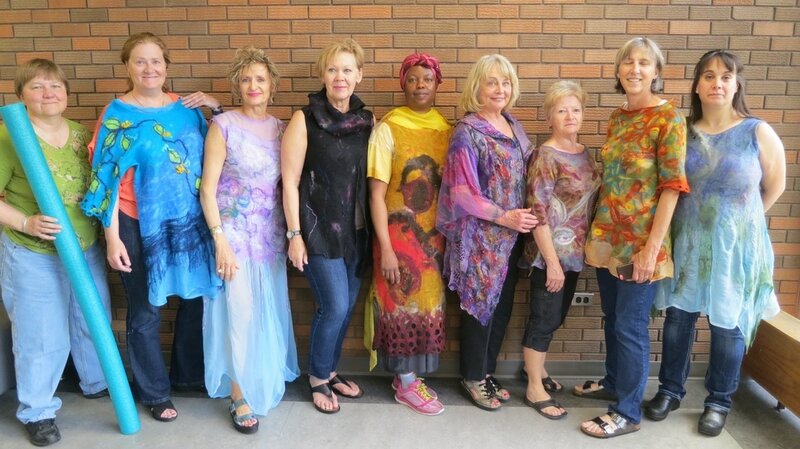 We begin the workshop with learning how to measure and create a seamless garment resist with shrinkage allowance called a "sloper" that allows you to design on it, more than one type of garment style made to fit you perfectly. 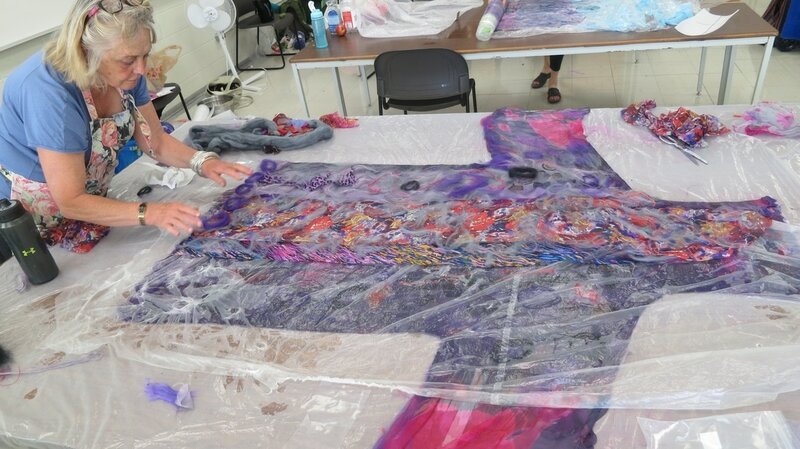 Laurie helps you to execute your design and this also helps everyone in the workshop to learn how to create many styles from each other. 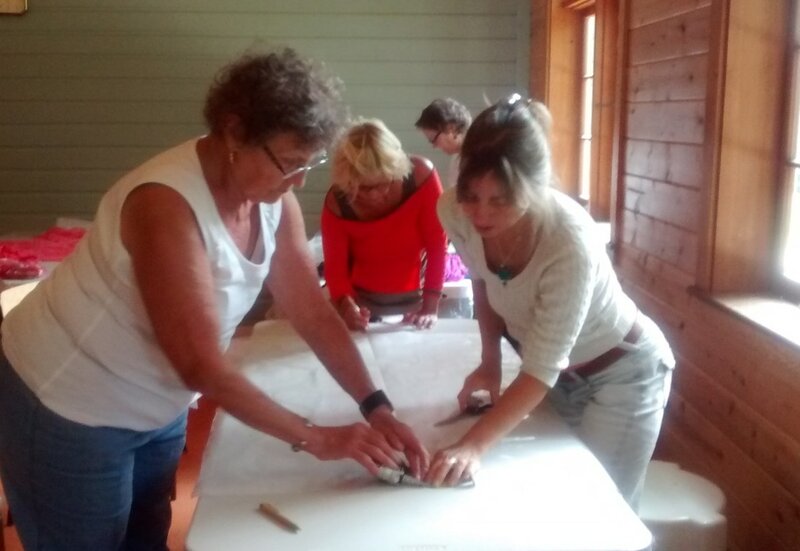 Demonstrations and tips for making the felting process easier are shown. Explore a new painting medium. 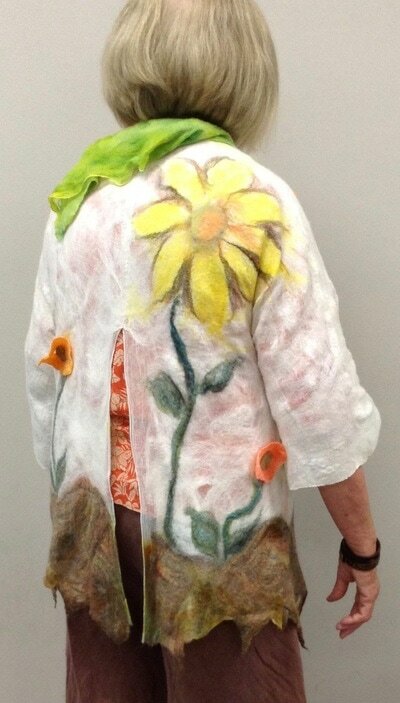 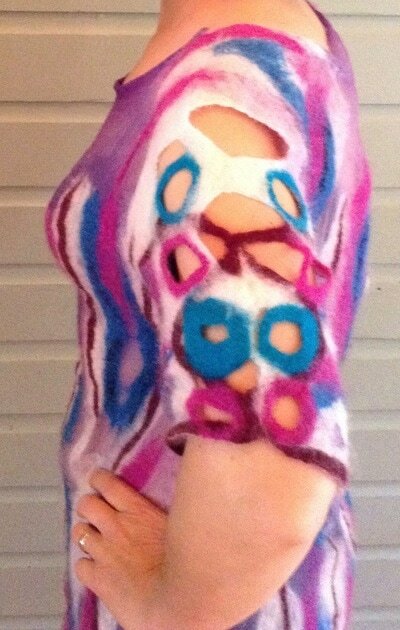 Learn how to paint your nuno felted garment as if you were creating a watercolour. 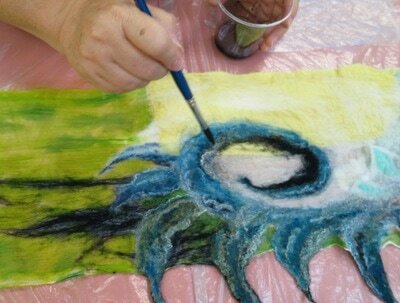 You will learn how to paint in layers and set them using a microwave. Understand how dyes work on dry and wet backgrounds and how wool and silk absorb the dye differently. 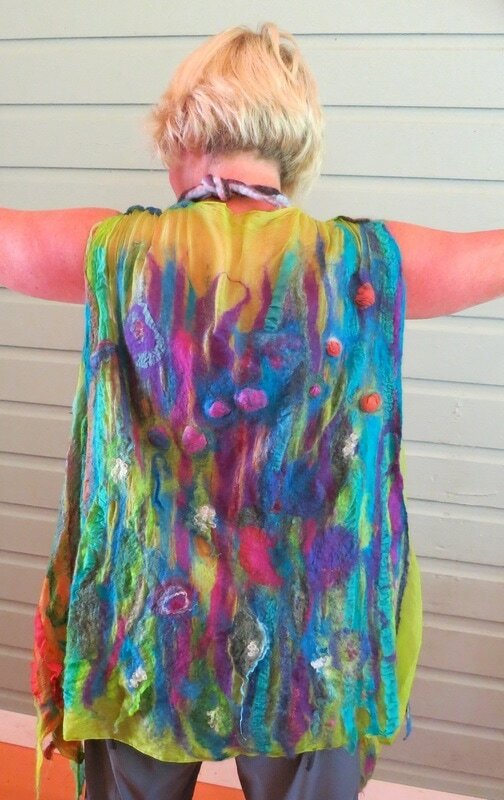 Come with an idea or create spontaneously. Laurie has 30 years of felting experience and can help you create anything you can conceive. 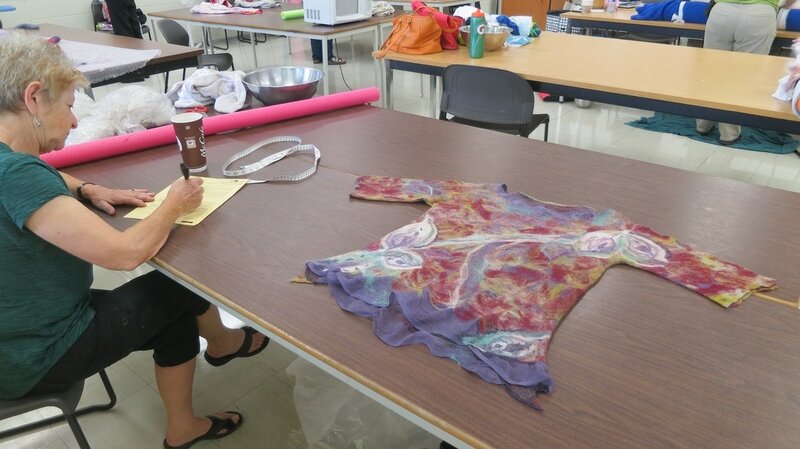 We begin the workshop with learning how to measure and create a seamless garment resist with shrinkage allowance called a "sloper" that allows you to design on it, more than one type of garment style made to fit you perfectly. 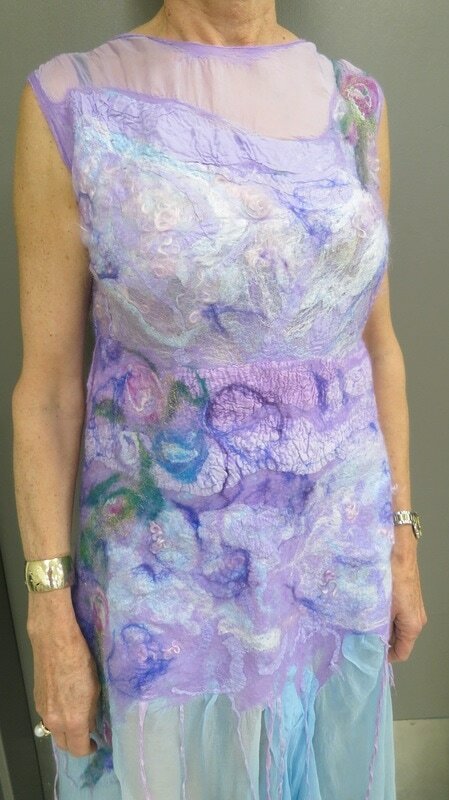 This can be either a vest, dress or tunic and has an option of including sleeves. This resist will be used to felt a garment which we will then mordant and dye with leaves. 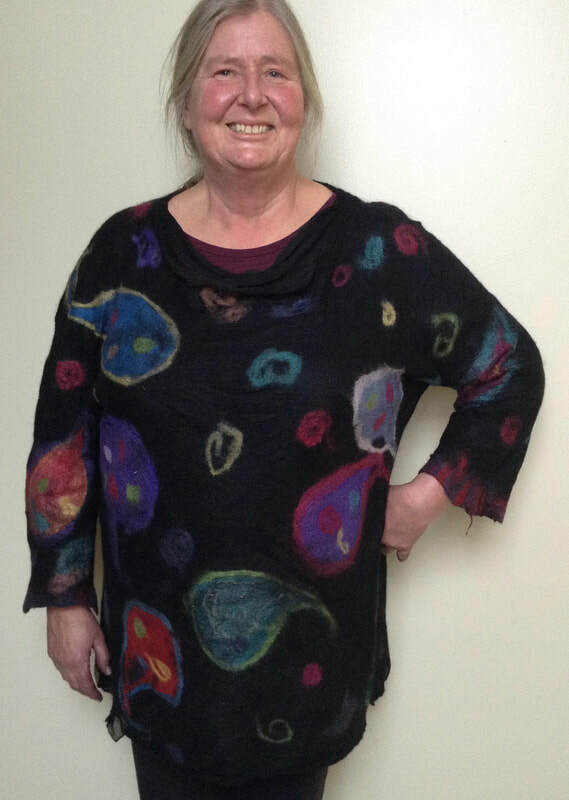 Take body measurements and create a resist sloper for the seamless nuno felt garment technique that fits you perfectly and can be used to create many garment styles from. Design and nuno felt your own garment style. 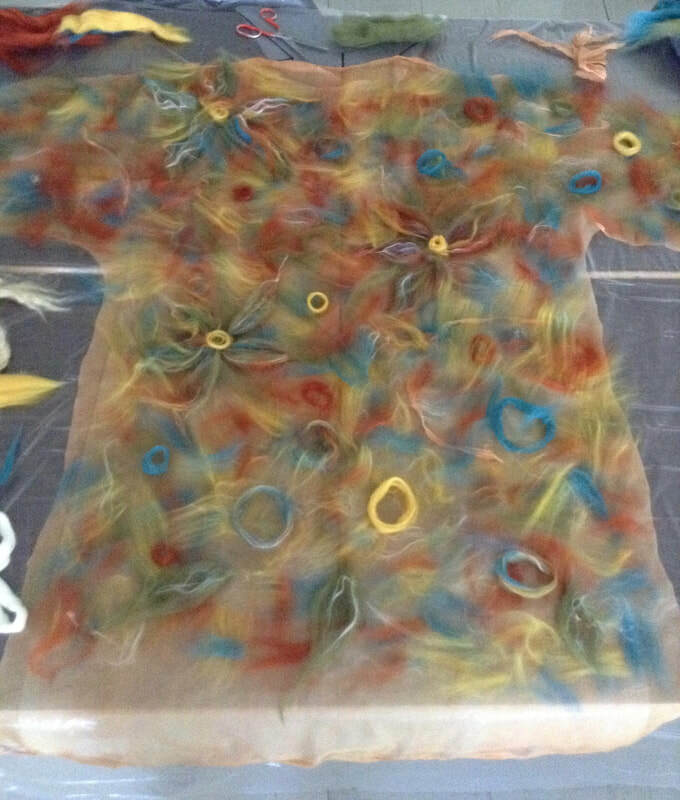 Eco-dye with the placing of leaves/flowers/berries. 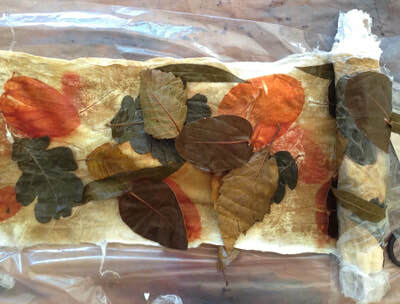 You will enjoy the amazing results of leaf/flower/berry pigments. Which leaves and mordants give different pigment colours, the time to harvest leaves and how to store them. The different ways to bundle and fix the pigments onto your fabric and the length of time needed for different results. 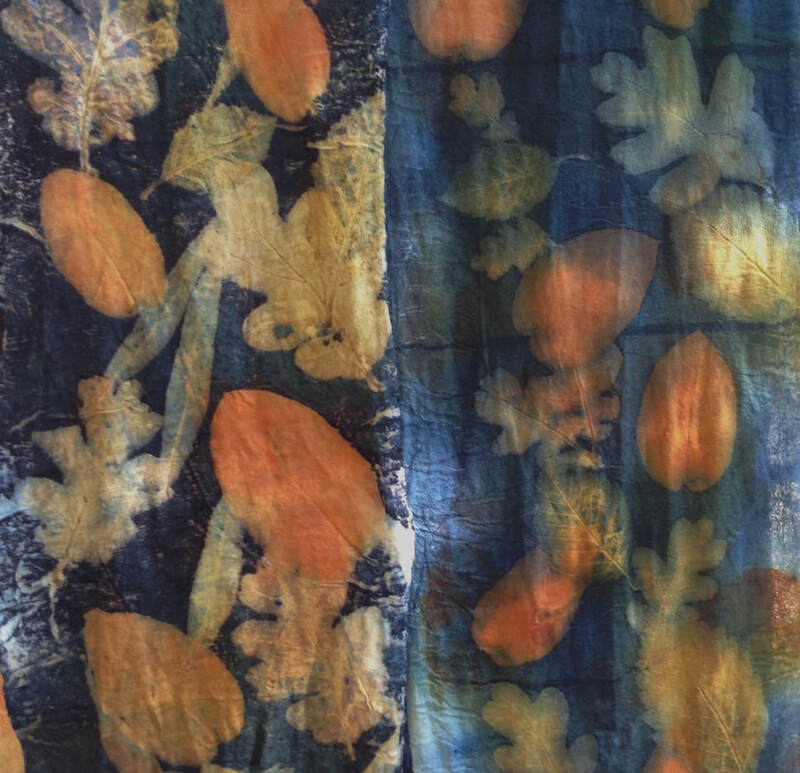 Combine eco-printing with the addition of a transfer dye process used in botanical printing to enhance the leaf silhouette.